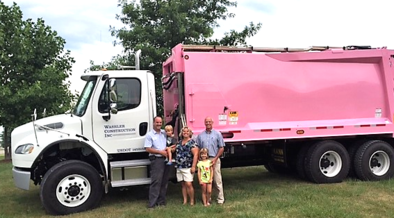 Home: Washler Inc, serving Allen, DeKalb, Noble, Steuben, and Whitley counties with outstanding trash and recycling services. Washler Construction was founded in 1997. In the begining we specialized in new home construction, then in 2012 we changed our name to Washler Inc and discontinued most construction services. Our primary focus now is providing outstanding trash and recycling services to Dekalb, Steuben, Allen, Noble, and Whitley counties. Washler, Inc. is the only garbage and recycling company in our service area with a fleet of split body trucks that are capable of collecting both trash and recycling materials at the same time. recycling and our split body trucks, no one makes recycling easier than we do. Has your garbage bill been going up? The national companies that haul trash in our area think it is just normal business to raise your rates every few months just to see if they can make a little extra off of you. See our "Why Washler?" page for more information on charges. Thanks you for taking the time to look through our website. We look forward to serving you. Help Kick Breast Cancer to the Curb! For each Pink Can our customers have, $5.25 is donated from every billing cycle to the American Cancer Society for the fight against breast cancer. If you would like to show your support of the fight against breast cancer with a pink garbage can, please call or email us and we will swap out your current can for a pink can. We will add $5.25 to your quarterly bill and 100% of that cost will be donated to the American Cancer Society. Thanks for helping to kick breast cancer to the curb! Washler Inc. makes every effort to ensure that its computer infrastructure is error- and virus-free but does not warrant that any material available for downloading from the Website will be free from infection, viruses and/ or other code that has contaminating or destructive properties. You are responsible for implementing sufficient procedures and virus checks (including anti-virus and other security checks) to satisfy your particular requirements for the accuracy of data input and output. Neither Washler Inc. nor any of its agents, employees and sub-contractors shall be liable to you or any other party for any claim, loss, demand or damages whatsoever (whether such claims, loss, demands or damages were foreseeable, known or otherwise) arising out of or in connection with the use of the Website or information, content or materials included on the Website.